Wheel of life / Samsara is the core view of life and cosmology of Buddhism, which refers to the endless cycle of reincarnation and perpetual transformation of consciousness within cause and effect, life and death, and the Six Realms (Heaven, Human, Asura, Animal, Hungry, Hell), without achieving Nirvana and breaking free form all sorts of troubles, pains, life and death, and cycle of existence. The work borrows the concept of ‘Samsara’ to illustrate the excessive and countless message and images in our daily life, which are rapidly produced, replicated, and spread to weave a massive cycle of information, in which mind and consciousness seem to be trapped endlessly without escaping. 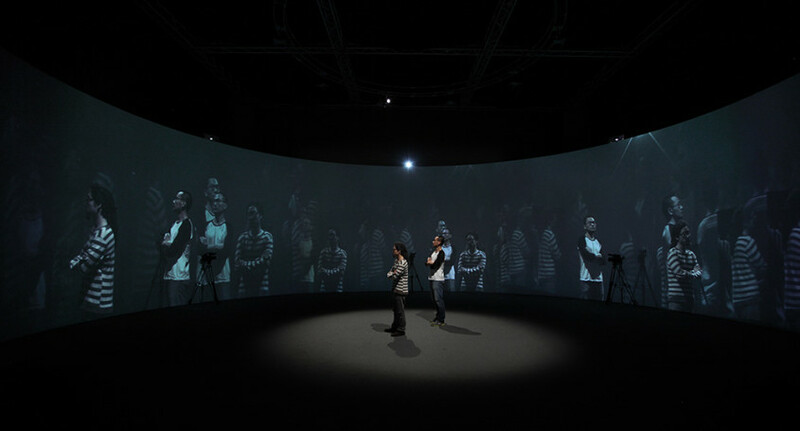 In the circular space, a number of cameras and projectors are interconnected. Cameras capture the images played by one projector; the recorded video is then transmitted to another projector to be broadcasted. The connected cameras and projectors form a massive feedback system. When audiences enter the space, they will be physically inside the cycle as their images are immediately captured, reproduced, and broadcasted.